That’s because the announcement didn’t come as an e-mail. I read about the event in a news story. If I’d received the info in an e-mail, I would have known it much sooner. That is if I could find that e-mail in my inbox. 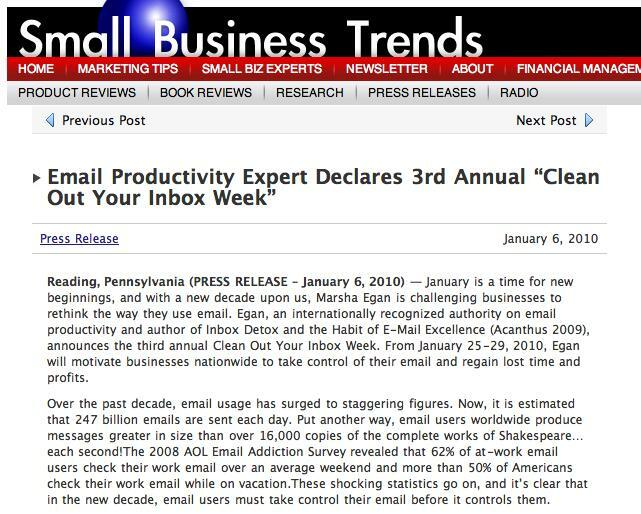 Marsha Egan, author of “Inbox Detox and the Habit of E-Mail Excellence” (Acanthus 2009), announced that Jan. 25-29, was Clean Out Your Inbox Week. I think this is a worthy goal for every week, so don’t let the fact that we’re a few days behind keep you from embracing the concept. Egan says we’re all spending too much time reading e-mail and sorting e-mail and re-reading e-mail and trying to find e-mails. I know you know what I mean. The news release announcing the week says that 247 billion e-mails are sent each day. Sometimes it seems like about half of those e-mails are in my inbox. 1. Set times for checking your e-mail every day. Egan says most of us are not using our work time efficiently, as we let e-mail throw us off the track of a work project. We’re working away and “Bing — You’ve got mail.” We open the mail and see some other task we are being asked to do or a date to put on the calendar or a question to answer, and we’re derailed from what we had set as a work priority for that particular time. Egan says to check your mail five times a day at the most. 2. When you do read e-mail, deal with each e-mail right then — delete, flag to deal with later, or move to a folder. She says we waste a lot of time reading and rereading some of the same e-mails. 3. Clean out your inbox. For most of us, this would be impossible to do in one session. She says to spend no more than an hour at a time on this mission. Enough blogging…I need to check my e-mail. Thanks for picking up this story! I hope you and your readers were able to take something away from it and get on the road to better email habits! I’d like to point out that Ms. Egan’s name is Marsha, not Martha. Would you be able to make this correction? Please let us know if you are interested in any more of Marsha’s material.